Since incorporation in 1994, Spay/Neuter Action Project (SNAP) has been dedicated solely to reducing the euthanasia rate in our community by educating the public about the benefits derived from spaying and neutering, providing programs which offer low-fee quality spay/neutering services, and providing financial assistance for these procedures. We're located in Huntsville, Alabama, in the northern part of the state. This is a cosmopolitan community, a city rich in historical landmarks, surrounded by beautiful mountains. The population is diverse, both in education and income levels, with many people from around the world, whose vocations range from highly educated engineers associated with NASA and defense contractors to rural farmers and factory workers in the outlying areas. There is comfortable blend of the old and new here with beautiful, old antebellum homes downtown and a just a few miles away, a Saturn rocket rising high into the sky over the Space and Rocket Center. Huntsville's population is 174,201 and county of Madison's population is 276,700. There are many small towns and economically disadvantaged rural areas that surround the city. Though we are blessed with several humane organizations, the county wide euthanasia rate remains at over 5,000 per year, primarily adoptable animals. Spear-headed by a small group of eager, dedicated volunteers but with an extremely low budget, SNAP has had to be resourceful in finding low cost or free advertising and publicity. Most work has been done by a core group of thirteen members of the board with other volunteers brought in for special events. From 1994 through September of this year, we have spayed/neutered 6,318 dogs and cats and given financial assistance of $11,924.89, plus altered an additional 78 feral cats at a cost of $3,818.00. Since July, we have been enthusiastically promoting "Maddie's Big Fix for Alabama" and are pleased to share the methods that we have found successful in promoting this program as well as previous endeavors. With few volunteers in 1994, we found THE most successful means of "getting the word out" about our low cost program was, and still is, flyers - printed, attractive flyers on bright yellow paper, either 8 ½ x 11 listing a phone number to call for more information, OR more popular is the 8 ½ x 11 with "tear-off tabs" at the bottom that people could take with them. Rule #1 in distributing flyers however is to target your audience. Time should not be spent distributing flyers about a low fee program in high income neighborhoods; information on fund raisers should be sent there. Master copies are given to volunteers and they are asked to make copies for distribution themselves thus cutting down on printing costs. Special areas of town are assigned to volunteers to target and avoid duplication of effort. Flyers are taken to any business that either has a bulletin board or agrees to place it in their window. The MOST effective flyer used has been a small ¼ page or even smaller that someone can pick up and take with them. The smaller sizes have proven to successful because businesses don't need to post them anywhere; they can be placed beside cash registers, on counters, etc., and people take them home The most receptive businesses are "mom and pop" locally owned stores. Convenience stores, laundromats, grocery stores, drug stores, hardware stores, restaurants as well as charitable organizations such as the Salvation Army, Goodwill, and social service agencies such as Medicaid offices, are usually receptive. Flyers have been distributed in large quantities at sporting events such as hockey games and also into the schools. Our SNAP certificate has a statement on it encouraging people to copy it and distribute to those who need it thereby getting the public's help in promoting our program. The distribution of flyers is easier and more fun with two people participating, one driving and the other jumping out and going into the businesses. If there are several businesses together both people can "blitz" the area and get it done faster. It's always important to talk to the business owner or manager about what you're asking them to post in their store and inform them about the project/event. They then become spokesmen for you. They should be told that this is a community- service project, that you're not selling anything, that you are a non-profit organization, and it's to the benefit of their customers to have this information. In 1996, SNAP organized a one day "Neuter-A-Thon" with a veterinarian in a low income neighborhood. This particular event was publicized primarily by six volunteers covering the lower income neighborhoods in close proximity to the vet's office with hundreds of promotional flyers and handouts. A local television personality who is an animal lover, donated her time to make a public service announcement and had it played frequently. Ninety eight cats were neutered in one day. As a young organization, SNAP had little name recognition with the public and found it helpful to work with other widely respected humane organizations. In 1996 we collaborated with local veterinary practitioners and humane organizations to start an annual February Spay/Neuter Campaign. At the conclusion of our most recent campaign, thirty nine participating clinics had altered 2,194 pets. To promote the Spay/Neuter campaign, a logo was produced and this same image was used for several years in all publications, handouts, commercials, etc. We learned that repetition and recognition of a logo is important. Collaboration with local artists and graphic design specialists is extremely helpful and adds a professional look to your organization, publications, and events. The theme needed to stay the same for recognition from year to year. The one used until recently was "Be a LifeSaver - Spay & Neuter Your Pet" depicting a dog and cat with a lifesaver around their necks. We had buttons made saying "Thanks for being a lifesaver" for vet office staff and participants. Local movie theaters gave us a special deal and made ads that ran before the movies started. Each year we gave the participating vet offices gifts, often things discounted by local businesses. The latest logo was designed by another artist and the theme changed to "The Big Fix for the Tennessee Valley" which depicted a cartoon dog and cat with band-aids on their bottoms and tummies. This logo is now being used state-wide for our "Maddie's Big Fix for Alabama" campaign. It has been very popular and seems to prove that humor gets the most attention. During the first campaigns we were able to get billboards around town at reduced rates. These were very effective but in recent years the prices escalated. A local billboard production company assisted us in producing the artwork. Other methods of advertising that are described below were used in this campaign also. We have used the newspapers as a major means of reaching the public. Newspaper classified ads and local free trade papers have proven to be an effective and inexpensive means of advertising. The Sunday paper has the widest circulation and the paper will tell you the other days with the most circulation. Ads have been placed under the classified ads in the Pets column in both dog and cat sections, announcing our programs. If the ad starts with an "A" it will be at the top of each column and seen first. Or, for a small fee part, of the ad can be in bold letters to get more attention. Also several small ads can be scattered throughout the classified section. 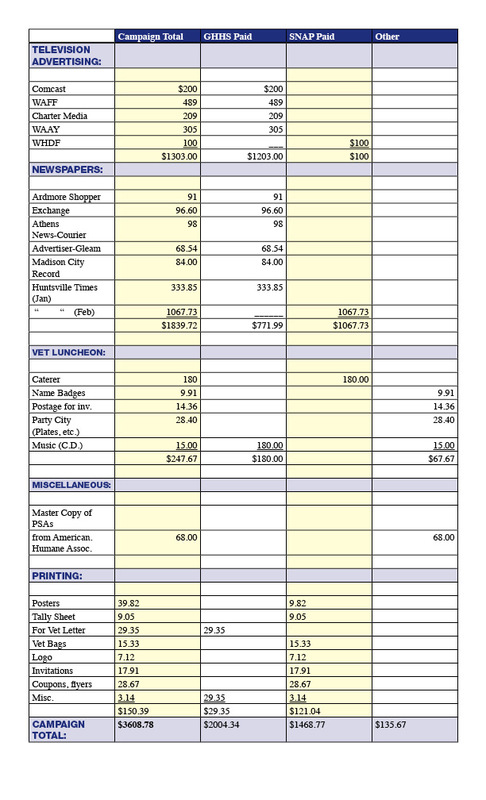 Ads in small, local papers are much less expensive than the larger papers. Seek sponsors for ads in all the papers. Letters to the editor are a free, great way to inform the public about events and programs. Most newspapers have a Calendar of Events where information can be posted. Newspaper articles, or feature stories, are free and offer the most effective publicity. Small, local newspapers are also more likely to run stories about an event. Suggest an interview, for instance, with a participating veterinarian. If there is an interesting aspect that the newspaper can focus on, they are more likely to cover it than just printing a press release. Press releases don't generally interest the public either; they want a story. Anything that can involve an animal and/or children makes "good news" stories and most likely will be accompanied with photos. Think of what will present a photo opportunity for the paper. An example might be to have a Medicaid applicant interviewed about how "Maddie's Big Fix" has helped her family, the process she went through, how she heard about the program, then bring the veterinarian and staff into the story. Included in the article could be stats about the seriousness of the pet population problem and why this grant is necessary for the state, who "Maddie" was, etc., and the impact this grant can have on the state. Newsletters have been an excellent means of reaching the public, not only our own but advertising the event in other humane organizations' newsletters and newsletters from area businesses. Radio stations will run public service announcements but if you can buy some time with them you can barter with them to play your PSA more often also. The stations will tell you what length of PSA they prefer, usually 10-20 seconds. Radio interview shows and talk shows are free, excellent ways to get the word out about projects. Don't be afraid to get on the air and talk. Television advertising is necessary today to reach large amounts of people. With so many people working, they aren't reading newspapers as much as they did in the past. Find the animal lovers at the local stations. Partner with a station or cable company and ask for their help in producing a commercial about your event. Raise money to buy time on their stations and ask them to in turn play the spot also as a public service announcement. Television ads are not as expensive as many people think, especially during early morning, daytime and late night. Most TV stations have local talk shows or time during their early morning or noon news where they will allow local groups to come on and talk about their projects. This is excellent free advertising. Television stations also have community calendars. There are several excellent video PSA's already produced for public service announcements available from American Humane Association and Spay USA on a variety of topics including spaying and neutering, adoping older dogs and cats, etc. Celebrities have done some of these spots and they can be "tagged" at the end with your organization's name giving your phone number as a point of contact. Ask a local television station to do this for you or it can be done by a business for a nominal fee. The American Humane Society tapes on these subjects are very humorous and we have found them quite popular in our area having used the spay/neuter spots for several years. Humor often gets more attention and a more positive response than emphasizing the tragedy of the pet overpopulation problem. Spay USA also has an excellent PSA that is serious but is very effective. The master copies can be bought from these organizations very cheaply and your local television company can reproduce them and make copies. You must find out what stations in your area prefer beta tapes or ¾ in. tapes. You can then distribute the copies to all the stations in your area. The television stations will play public service announcements free of charge but they do tend to put them in off hours, like early morning and late evening but it's still effective. Learn who is the PSA director of each TV station and send them a note along with your videotape when you want them to play something. Be sure to put a contact number on there and give the beginning and ending run dates you desire. Then call that person back to make sure they got the tape and encourage them to run it. Funding for all our projects has been very basic, primarily with donations, memberships, and sales of various items such as cookbooks, T-shirts, nice chocolate suckers designed for specific holidays, garage sales and theater tickets. Telling the public what we're trying to accomplish and what we have accomplished to date in our newsletter has brought in donations. Especially effective is telling the public the stories about the animals that have been helped and the ones that still need it that may be on a waiting list for funding. Last year we had a silent auction of donated art and antiques that raised approximately $10,000 and was our most profitable fundraiser to date. To better target low-income families, we started the SNAP Qualifying Program. This program serves families whose income is less than $25,000 per year and those who are on food stamps or WIC. Those who are on Medicaid are referred to "Maddies Big Fix". We were able to implement this program the end of July. Since then over 200 surgeries have been performed and/or scheduled. We then had to decide how to get the word out to these people. We decided to target various low income areas and limit our advertising to that area. There is one television spot that SNAP had produced advertising "Maddies Big Fix" that is airing across the state so some clients are already familiar with that program. We began by targeting our flyers in a small, low-income neighborhood in Huntsville. Next we expanded the coverage area around that neighborhood, an approximate 5 mile radius. We then added a small town east of Huntsville and its surrounding rural area. We repeated the same areas when we expanded to another area thus allowing the same people to be contacted more than once and reinforcing the message. Repeated coverage of the same area has proven to be effective. To make it simpler for clients to get the surgeries, we decided to go into the various neighborhoods and make the actual spay/neuter appointments. Pre-qualifying clients also minimizes the paperwork at the veterinarian's office. With the help of the veterinarians and their staff, we designed a form that gives client and pet information as well as appointment time, pre-surgical instructions and a disclaimer the client must sign. It is best to have three volunteers at each event, although two can manage if necessary. Each event lasts about four hours. We schedule one or two events per month. The place where we initially wanted to be would only let us set up outside, so we needed shelter and a table and we wanted to create some kind of presence. We borrowed a canopy from a local part supply company, an 8 ft. table from a hotel, and brought our own chairs. One of our volunteers donated, at cost, a table skirt with our logo and a banner for the top of the canopy that read "FIX YOUR PET ... $10 OR LESS!!" Cats need to be contained when taken to the vet and some of our clients do not have and cannot afford carriers, so we ordered 50 carriers to give the clients free of charge. We also felt that we needed a phone line dedicated to our low-income programs so people could get information and have their questions answered. The phone number is on all flyers. We have had about 100 calls since the end of July. Our first location was a Teen Center located between the low-income housing project and the low-income neighborhood we wanted to target. We did a direct mailing to about 600 homes in the neighborhood as a bulk mailing, non-profit rate costing $80.00 We printed 850, ¼ page flyers and 40, 8 ½ x 11 flyers listing qualifiers and the time and place where appointments for spay/neuter surgeries could be made. We put the ¼ page flyers on an additional 600-800 mailboxes. This took two volunteers eight hours to distribute these flyers. We put both the large and small flyers in gas stations, convenience stores, Laundromats, neighborhood grocery stores, pawn shops, thrift stores and Quick Cash establishments. The Teen Center director also put 400 flyers in the boxes of the Boys and Girls Club directors to send home with the kids. We scheduled 21 surgeries at our first event. We asked everyone how they heard about it. Only two came as a result of the direct mailing which turned out to the most expensive and least effective method. Only a few people responded due to the flyers left at their residences. It took one person six hours to distribute flyers to offices and businesses yet the most people said they or a friend saw the flyer at businesses, laundromats, etc., or the Food Stamp or Medicaid office or the Free Medical Clinic. So the advertising method that was most effective was to distribute flyers and handouts at public places. The interested people will pick up the information or read the flyer. This is cheaper and much less time consuming. Usually welfare checks come out on the 3rd of each month so the timing of the events is important both for availability of ready cash and location. Our second location was a Wal-Mart near the same neighborhood on the 4th of the next month. The turnout was better. Forty-five surgeries were scheduled. We put out flyers only at businesses, the Health Department, Food Stamp and Medicaid offices. Most responses were from the flyers. We had one or two walk up customers. Perhaps the most successful event for the effort expended was at a grocery store in Gurley a small town outside of Huntsville. It took one person about five hours to put out flyers in every business in town and on the highway between there and Huntsville. The local elementary school sent another 420 flyers home with the children. We delivered them bundled according to the number of children in each homeroom. Forty-five surgeries were scheduled. When we met and talked with the clients, it was obvious that there was a great need in that area. Targeting the businesses in rural areas is effective because everyone shops in a core location, i.e., the same grocery store, drug store, post office, etc., for all of their needs. Therefore you can spend less time distributing flyers and cover a larger rural area. We had another event at the previous Wal-Mart location and scheduled 55 surgeries. There was more walk-up business, but also, more clients who were already familiar with our programs. It seems that repeat locations may be helpful. The next event was at the Salvation Army Thrift Store. We tried putting only the SNAP phone number on the flyers that were distributed the week before, not the time and place where we would be set up. The turnout was very low and we had only a few hits on the phone line. Since clients could call the phone line and find out about future times and locations, there was no sense of urgency to attend this particular event and therefore little response. A limited time offer seems to be a good motivator. To target one area or neighborhood, distributing the ¼ page flyers along with a few 8 ½ x 11 flyers seems to work the best. It is also the least expensive. Though distributing flyers to the businesses is somewhat time consuming, it can be done by one person. There is no cost, except for gas, involved in the distribution and the turnout is rewarding. Distribution through schools is a great way to expand the area covered and target homes directly. We set up in the same area several times in a row. Being there repeatedly seemed to help the turnout. News spreads through word of mouth. In conclusion, we have had great success targeting neighborhoods and businesses with our flyers. Talking to the people face to face seems to be important and is an educational opportunity in itself. We are getting an increase in calls on the SNAP phone line by having that number on the flyers and we expect the calls to increase with time. Canopy - A used canopy was donated by a party and entertainment business. Approximately 27% of clients needed carriers. Janis Gibbons has a background as an instructor in graphic design. She serves on the SNAP board as a coordinator of the low income qualifying program, newsletter production, and grant writing. She is also very active with a feral rescue group called "Friends of Ferals". Phyllis Hall's background is in medical record administration. She has been involved with SNAP for 7 years serving as secretary and president and also serves on the board of the Greater Huntsville Humane Society. The annual Spay/Neuter campaign and Homeless Animals Day are events she has co-chaired for these organizations.